I'm sure you've seen that story circulating around this week - a young couple takes their toddler into a diner, the toddler gets fussy (as toddlers do), and the owner flips out and yells at the child. And she's not in the least bit remorseful. So, aside from the fact that there is something wrong with yelling at a child period (let alone a child who is not your child), there are a number of other things wrong with this picture. To begin with, I find it very strange that the owner is complaining about the child's parents ordering her three pancakes. Um...isn't she supposed to want people to buy more food in her diner, not less? But aside from that, her reaction and the comments on every article I've read about this are very telling - people have forgotten what normal child behavior is. 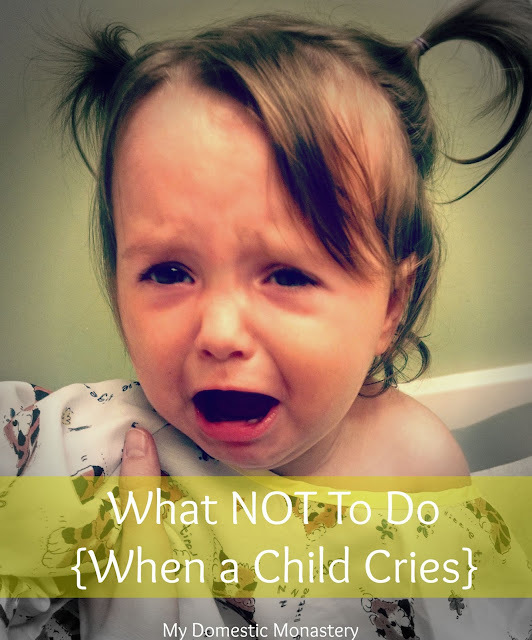 People are not around enough children to know how children behave and that not every crying child is "bratty." Not every parents of a crying child are bad parents (the vast majority aren't). This isn't surprising - we live in a society where two children or less is the norm. There just aren't very many children around, anymore. So, on the one hand, I can't terribly fault these people because they just haven't been exposed to children. Period. But on the other hand, I do fault them. Because, again and again, the comments people have left on this story revolve around the sympathy they have for the owner and the other patrons, and the entitlement of the aforementioned to being able to eat in silence. But...that's just not life. And that's certainly not life with children! The underlying assumption seems to be that you can control your child, can predict what her behavior will be. But you can't. Part of teaching a child how to behave in public means that they need experience being in public. That also means that, sometimes, they are going to get fussy. That's normal. From what I could gather from this story (and the age of the child) she wasn't being bratty - she was acting hungry and maybe overstimulated. If she had been my child, would I have taken her out of the restaurant? Yes, probably. Do I think the couple should have asked for a box to go if she couldn't settle down? Yes, probably. But does any of this excuse the response to this situation? NO. Because what came out, dripping all over the comment boxes, was an absolute repulsion toward children. What came pouring out was the frustration and disgust that people feel toward children. It is hard to parent children in a society with that kind of attitude. I will say, this is where I am incredibly grateful for most Catholic churches. I have encountered one woman - in my nearly five years of parenting - who wasn't nice about my chatty/fussing toddler. But that's it! Everyone else I've met has either ignored us or been incredibly kind. There is an understanding that these little ones belong in the Church. Yes, there are people who respond this way when a child cries at Mass. There are people who hate any sort of inconvenience or interruption. But the overarching tone of our faith (straight from the pages of the Gospel) are that the children belong here. They have a place. If someone has a problem with the presence of children at Mass, well, that's their problem. Even the guy in Rome agrees, wholeheartedly. Do parents have a responsibility to raise their children well? Yes. Do they have a responsibility to teach them how to behave in public? Yes. But are children sometimes unpredictable and act out terribly, not because of anything a parent is or isn't doing? Yes. Does showing anger and blaming those parents help the situation? No. Does offering to help them in some way (i.e. offering to box up a restaurant patron's food and get them their check, so they could make whisk a crying child out to the car faster) make a difference? YES. Part of living in a civilized society is accepting that people don't always do things the way we want them to, and that we can't just start yelling and scaring them if they aren't doing what we want. Part of living in a civilized society is learning to show compassion and give one another the benefit of the doubt. Part of living in a civilized society means that when we see someone who is crying or stressed (as I'm sure these parents must have been) we do what we can to help. In some ways, there was very little difference between the behavior of the restaurant owner and the toddler - except that the restaurant owner should have known better. I'm not sure if I would have understood this as well before having my second born, but having a baby with colic really opened up my eyes. Sometimes she would (and still does) just cry. We couldn't live in our house for the first two years of her life. We had to leave, had to take big sister to school, go grocery shopping, visit friends and family, go to Mass - and sometimes she cried. We did our best, but sometimes there was only so much we could do. Being able to still go to Mass during this time (even if I was pacing in the narthex with a screaming baby) fed me in a way I genuinely needed. Had someone approached me with this kind of harshness, it would have devastated me. Bottom line is - children cry (some more than others), and even the best of parents sometimes have kids that are fussy and cranky (if it can happen to Kendra, it can happen to anyone!). There's no need to add to the yelling or animosity. There is much need for increased compassion, in a society that has forgotten the importance of the weak.